The first three semesters are based on lectures, lab exercises and laboratory sessions, while the last one is based on independent work related to the Master thesis. 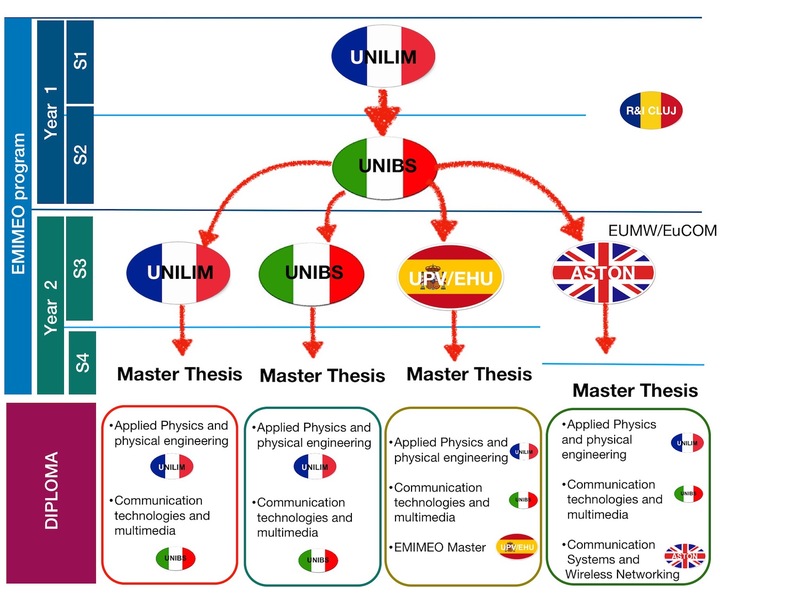 The first-year programme combines the contributions of modules of Masters of UNILIM and of UNIBS: with a first placement period in France and then in Italy the mobility scheme offers a synergic programme of fundamentals in analogue and nonlinear electronics and photonics. Students in the second year will move to one of the four partner institutions intensifying their study around one of the four paths and the associated and dedicated lab equipment for the third semester (S3): Active Management of Power Waves (AMPW) at UNILIM, Remote Sensing (RS) at UNIBS, Communication Systems and Networking (CSN) at ASTON, Instrumentation and Control Systems (ICS) at UPV/EHU. Finally, the Master thesis (fourth semester) can be carried out in any of the partner institutions or associate partners, under the guidance of a professor from one of the partner universities.